I can’t speak for anyone else, but it sometimes seemed that the opening day for Tūranga would never arrive. And then it did! Tūranga, Southbase Construction, 18 September 2018. Photo by Pam Carmichael Photography. And what a day. You couldn’t have picked a less pleasant date, weather-wise, if you’d tried. Driving rain, occasional hail, and bitter cold – appalling weather for a library opening… and still our beloved, loyal customers came in their thousands. 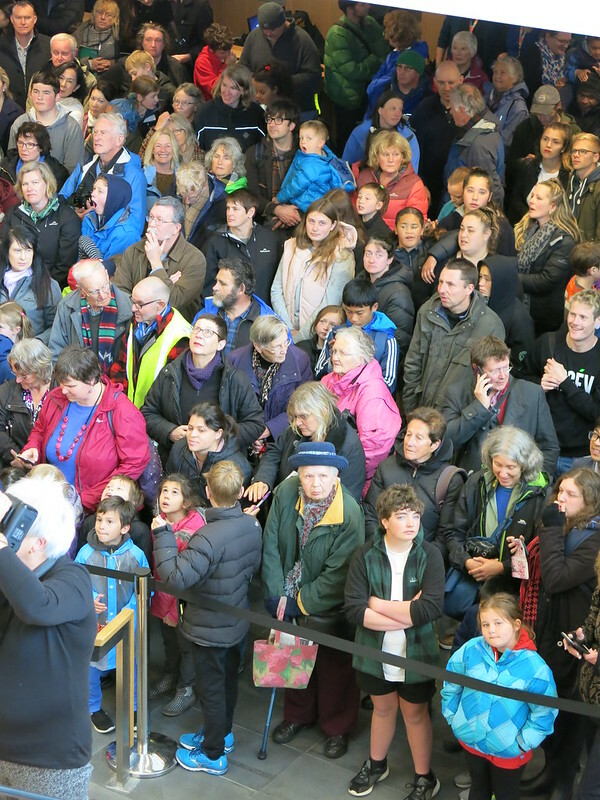 I’ve pulled together all the media I could find relating to Tūranga opening in this post, along with some of the messages of support and celebration we’ve received via social media – it’s been a great time to be part of Christchurch City Libraries, feeling the aroha from people all over the city and further afield. ‘New set of memories for a new generation’ – five-storey, $92 million library opens in Christchurch 1 News, Sam Clarke, 12 October 2018, includes short video. New library a ‘game changer’ for Christchurch, Scoop.co.nz, 12 October 2018. Doors open to Christchurch’s new central library, Tūranga Stuff.co.nz, Michael Hayward, 12 October 2018. Includes video and quotes visiting librarian, Kris Wehipeihana. Reminders of why libraries matter Stuff.co.nz editorial, Philip Matthews, 23 October 2018. Emphasises the democratising force that libraries can be, praises the bicultural approach, and mentions Tūranga in tandem with Kāpiti Coast District’s Rainbow Storytimes programme in terms of inclusiveness. Two big reasons to hope that Christchurch city is coming back to life, The Spinoff, James Dann, 23 October. Places Tūranga in the context of Christchurch’s rebuild, alongside the Hoyts EntX cinema development and Margaret Mahy Family Playground as a successfully reinvigorating the central city. 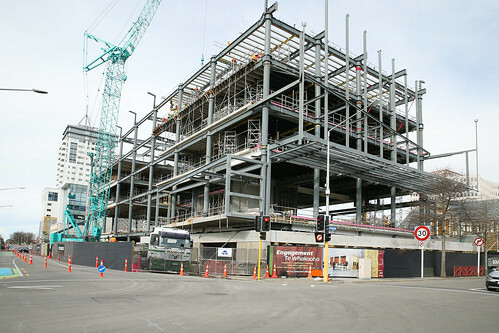 New library one of the most successful parts of the rebuild, Stuff.co.nz, Opinion piece by Johnny Moore, 1 November 2018. A digital future for libraries, Newsroom, technologist Richard MacManus talks about the new technology available at Tūranga, eBooks and online content available through libraries generally, 30 October 2018. Tūranga Christchurch Library opens after years of work, Radio New Zealand. Short interview with Carolyn Robertson on Morning Report, 12 October 2018. The Panel, Radio New Zealand, Jim Mora, Matt Nippert and Amy Carter discuss libraries, and in particular, Tūranga. Discovery wall described as “friggin’ awesome”, 29 October 2018. Christchurch’s new $92m library opens to much fanfare , Radio New Zealand, Lyn Gifford talks about the former Central Library and the changes between the old and the new at Tūranga. Flickr images from Tūranga’s opening day. Monitoring library social media the last couple of weeks has been a) a lot busier than usual but b) a delight, as people discover Tūranga and share their joy and amazement online. Below is just a selection of the great feedback we’ve had from library lovers. It’s quite overwhelming. Lots to take in. Loads of people wandering around with smiles on their faces, soaking in the atmosphere. Bit like when MM Playground opened. V good for the soul. It has sewing machines and a recording studio! I’m finally visiting Tūranga, Christchurch’s new central library, and it is unbelievably brilliant and HEAVING WITH PEOPLE. Field of dreams, Ōtautahi. Build it and they will come. Outside the main media outlets, other organisations, customers and visitors have their own thoughts and reflections. Schmidt Hammer Lassen and Architectus Design Earthquake-Resistant Library in Christchurch, Arch Daily, 16 October 2018. Schmidt Hammer Lassen Architects completes an earthquake-resistant library in Christchurch, NZ, Archinect, 16 October 2018. Tūranga Christchurch library by schmidt hammer lassen + architectus opens in New Zealand, Designboom, Sofia Lekka Angelopoulou, 17 October 2018. Focuses on the architectural and engineering of Tūranga. Schmidt Hammer Lassen wraps earthquake-resistant Christchurch library in golden screen, Dezeen, 17 October 2018. Dansk designet bibliotek åbner i jordskælvsområde, Licitationen, one of Denmark’s largest construction industry publications, 17 October 2018. Vorhang auf Bibliothek in Christchurch von Schmidt Hammer Lassen, Baunetz, Germany’s major architectural online publication, 22 October 2018. Christchurch’s New Central Library is Practically Earthquake-Proof, Azure magazine, 23 October 2018. Tâwhaki im goldenen Gewand: Tûranga Christchurch Central Library von Schmidt Hammer Lassen Architects, Detail, major German trade journal for architects and builders, 23 October 2018. Christchurch debuts its new earthquake-resistant public library, Tūranga, Idealog, 18 October 2018. Earthquake-Resistant Library Opens in Christchurch, Urban Developer, 19 October 2018. Tūranga – Christchurch’s new central library New Zealand Micrographics Services, Andy Fenton, 19 October 2018. Describes being at the opening ceremony and acknowledges the hard work of library management and staff in making Tūranga what it is. Christchurch’s new central library opens, Architecture Now, 24 October 2018. Tūranga, the new Christchurch central library opens in New Zealand from SHL Architects on Vimeo. Timelapse video across the whole of opening day, 12 October 2018. Video of the opening ceremony, 12 October 2018. ‘Ngā toi o Tūranga‘, video from Te Rūnanga o Ngāi Tahu, posted 17 October 2018. Includes short interviews with artists whose work features in Tūranga and discusses the cultural narrative of the buildng. Video made by a family visiting Tūranga for the first time. Posted 16 October 2018. If you’ve found any other news items, photos, or videos that should be included in this Tūranga roundup please let us know in the comments and we’ll add them in!